If you put snow tires on a specially built bicycle you’ve got the way to travel through the Badlands. Your tourism opportunities just took a turn for better health. South of Watford City at the CCC Campground just off of Highway 85, you’ll find an easily accessed and groomed trail for hiking, xc skiing, snowshoeing or fatbike riding. Not just the tires, but the entire frame, sprockets, gears and axles of a fat bike are set up to help riders through the snow. Explore. Exercise. Get away from the crowds – unless of course, it is the Poco Rio Frio race. Then you have an additional benefit of getting with like-minded people. Outdoorsy, healthy, happy. Riders, hikers, snowshoers and cross-country skiers could take a break around a campfire, get a bite to eat before their next loop on the trail. “I think the best part is getting with other out here, friends to share this experience with, “said organizer Nick Ybarra. Ybarra promoted the event across the region. One week before he’d organized a snowshoe trek on the same track. It packed down the snow that otherwise would be as much a four feet deep. The afternoon work by Ybarra, his family and friends turned the trails in to perfectly groomed trails for riders, showshoers and cross country skiers. A cross country skier navigates the Long X trail on a two to five-mile loop. So, when riders hit the trail, it was packed and ready for their fat bikes. Riders from as far as Fargo, Hazen and Bismarck racked up miles on two loops through the upper Badlands, one 2.5 miles, the other 4.5 miles. Sean Hatten on one of his many laps to his first place, 54-mile victory! Around and around the loops they went. The longest ride of the day was 54 miles! Both with their unique challenges such as the portion over the creek that empties in to the Little Missouri River. It’s frozen now, and in the morning, it was glare ice. After snow fell mid-day it became a smooth track easy glide for a short section to break up the heart-racing, deep breathing of the hills riders pedaled up and coasted down. Riders looped around on the head of the Maah Daah Hey trail. Or they followed the Long X trail, or both. The goal was to make as many laps as possible in the allotted time. The Poco Rio Frio race included 19 fatbike riders, 42 snowshoers, and two cross country skiers. After each round, they marked their mileage at the relief tent. More than 40 people on snowshoes explored the loops in the Badlands in the Poco Rio Frio race. The miles added up…30, 40, 50 miles or more logged at the relief station at the head of the trail. Here’s where riders laughed, ate and powered up for their next set of loops. Collin Kemmesat is the General Manager of fat bike dealer Epic Sports in Bismarck, and he was as pumped as anyone about the Frio race. His knowledge and experience could help with any mechanical issues, but mostly he was there to rack up fat bike miles. Collin has a passion for bikes. “Fat biking has not peaked,” he said. “It’s popular all year around. Winter riding is best when there’s not a lot of snow. “This winter’s near-record snow depth has curtailed some of the fat bike riding. That’s why the packed trail for the race was a great opportunity. Kemmesat said trails along Harmon Lake north of Bismarck, and other trails in the capital city are getting more interest. Ybarra has taken on the care and use of the Maah Daah Hey trail, organizing a half-dozen mountain bike rides a year on the trail. His goal is to bring back the popularity of the trail as it was 10 or 15 years ago. The 130-mile trail that loosely follows the Little Missouri River to southern North Dakota will become increasingly more well-known in 2017 as Ybarra and his happy bike trail friends put out the word. 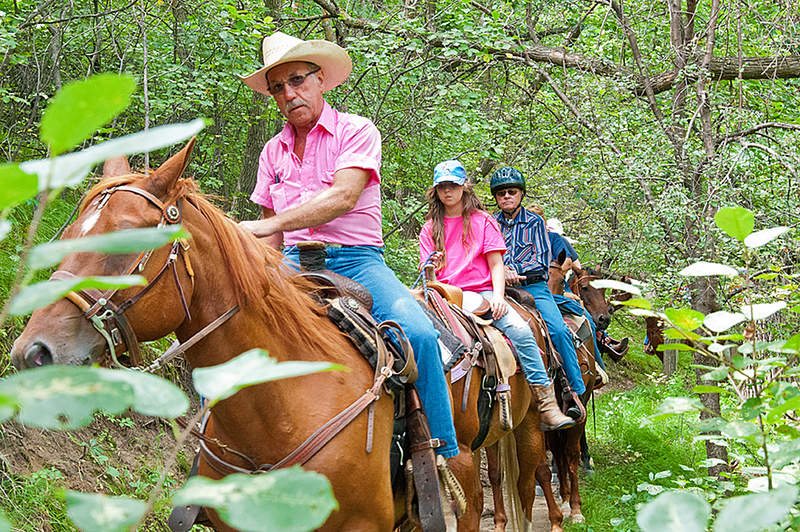 What can we do to help you get started riding or hiking the Maah Daah hey? Name it in the comment section below. Quick! Now that school is on break! 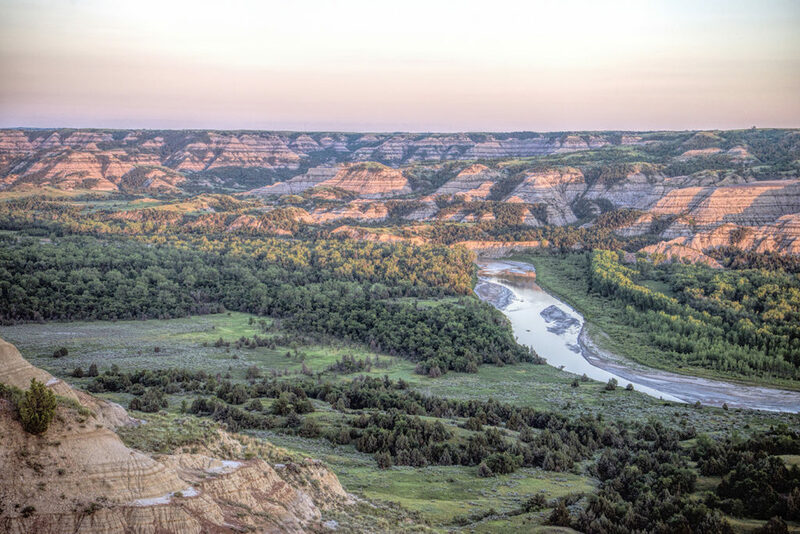 You’ve got a bit of time to gather the tribe of kids, family and friends to get out west and see a part of North Dakota that’s easily missed. The best part is, the biggest cost will be your gasoline because there’s plenty to do in Western North Dakota that will build memories. Here are five free things to finish out your summer memories. If you and your family like regional history or Lewis and Clark experiences, then head to the northwestern part of the state, and get right up to the Montana border. 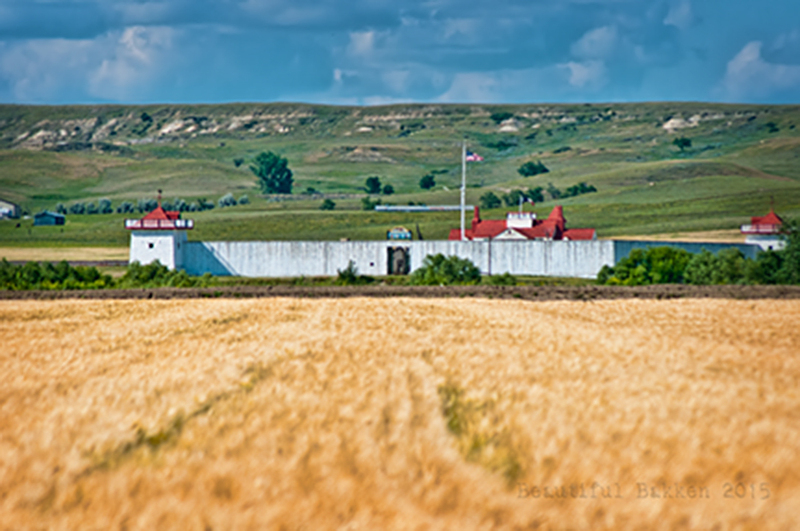 About halfway between Sidney, Montana and Williston, North Dakota is the Fort Union Trading Post. Late summer, it’s a fairly quiet place for you to explore. In June the rendezvous brings the era of the early 1800’s to life. Decades before the Civil War, settlers, trappers, soldiers and tribes from the Northern Plains met here peacefully to trade goods. Approaching from Sidney, take a gravel road north to the river to see how the trading post must have looked to trappers and tribes from across the river — minus the wheat fields. From inside the Fort, looking back to the other side of the river, in the trees where the shot above was taken. To keep the youngest members of your group entertained, you probably won’t stay here long, but there are two more stops nearby. Head around the bend to Fort Buford where you can camp (for a fee) or explore the Confluence Visitor Center and get three views of early Plains life. It doesn’t cost anything to wander the streets of Medora. There are several good places to eat. If you’re an ice cream lover you’ll get surprisingly large servings. Ice Cream at Medora is actually a summer goal for many families. 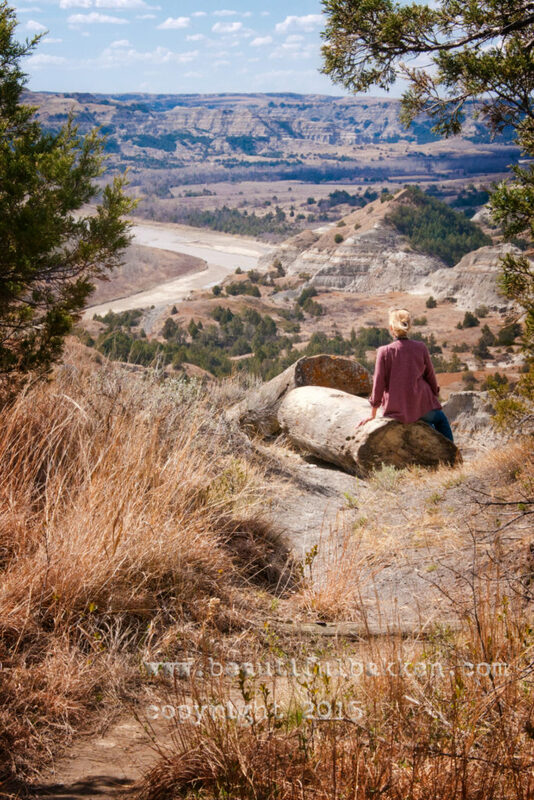 It’s easy to get to Medora, right off of I-94, about 25 miles from the Montana border. If you and your family want to take advantage of the exercise opportunity, take your bicycles. It’s free to pedal the streets and trails nearby. Many families do. 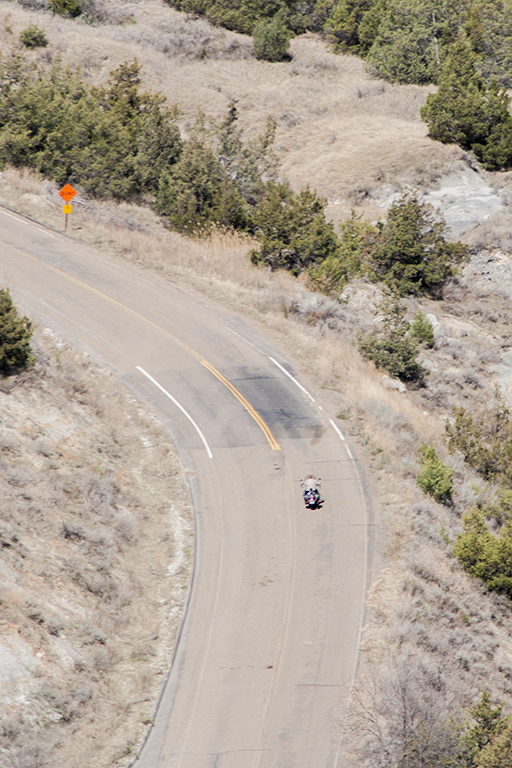 There’s no cost to bicycle the town, take the East River Road south of town, or take the recreation trail across the Little Missouri River to the west of Medora. An option that is not free is to rent bicycles in town. 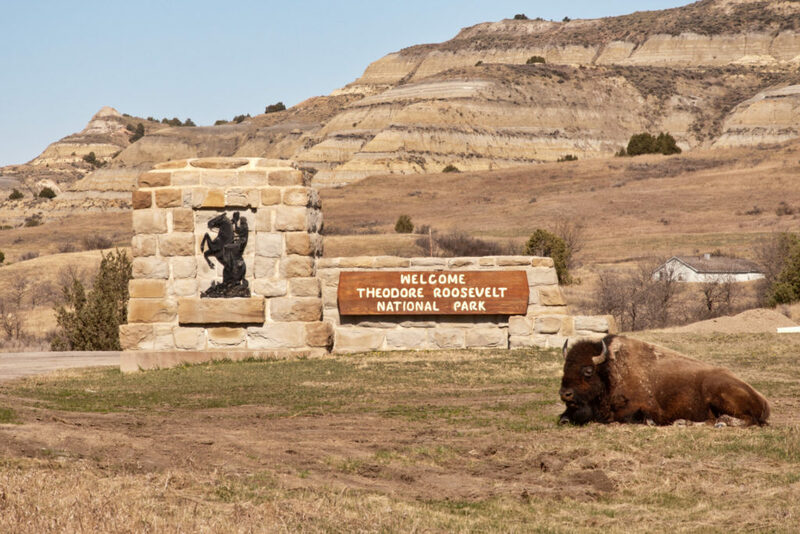 Or bicycle in to the south unit of the Theodore Roosevelt National Park, you’ll have to pay the entrance fee. 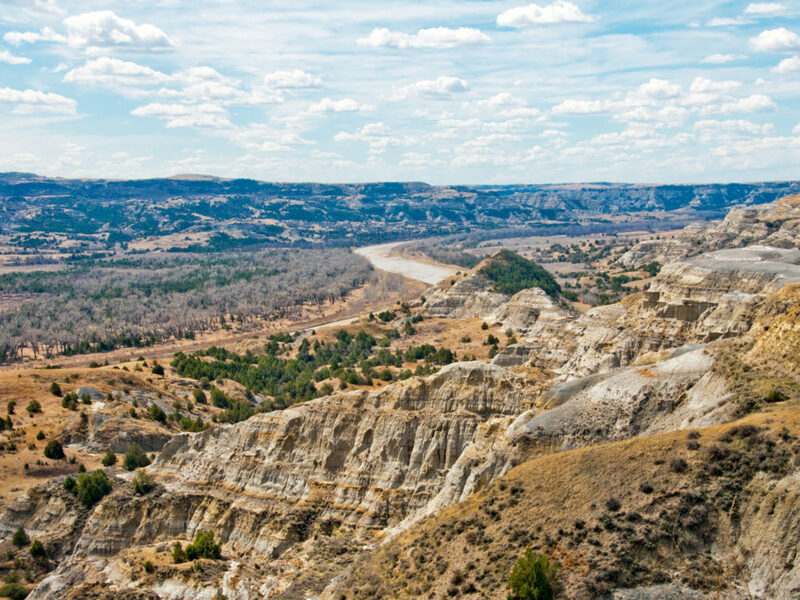 Its entrance is on the edge of Medora. A family takes advantage of the paved bicycle trails around Medora and out in the country. 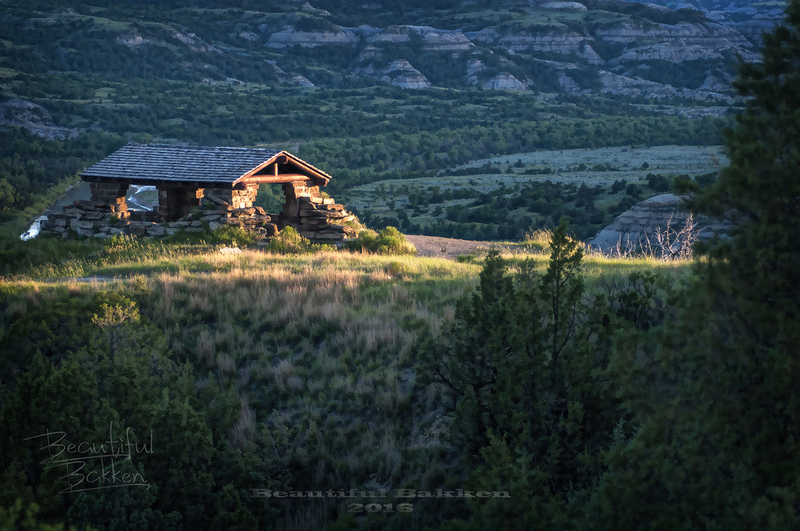 Pay the entrance fee and take a bicycle ride in to the South Unit of the Theodore Roosevelt National Park. Take supplies, though. You will need to carry plenty of water. 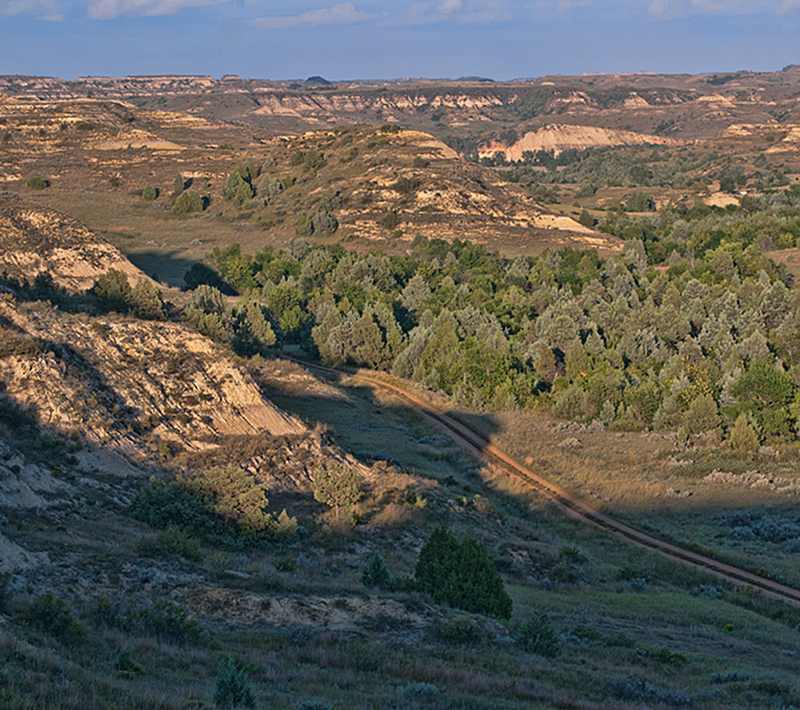 North Dakota’s legendary Maah Daah Hey trail is a mountain biker’s dream. Families can get access to as much or as little of it as they want — free. You don’t need a bicycle. Your feet go with you, right? Take them and use them. 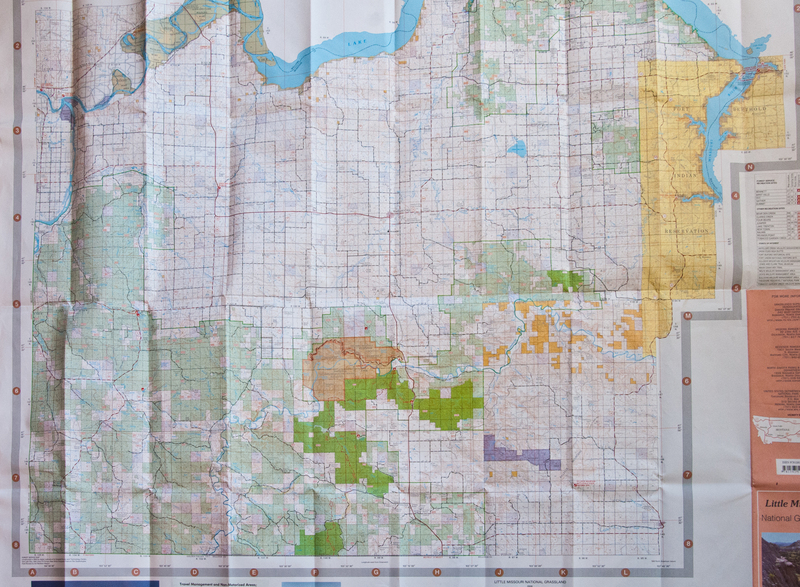 Maps of the trail are available on-line, or buy the most comprehensive map from the U.S. Forst Service. The U.S. Forest Service map costs about $13 and is the most valuable tool (other than your camera) that you can take. Even short little hikes will keep the youngest in your family entertained if they know the destination is right down the path. For a short hike with a rewarding destination, park at the Ice Caves Maah Daah Hey parking lot and take a half-mile hike to a cooling spot. The Ice Caves is part of the Maah Daah Hey trail. It’s about 10 miles south of Grassy Butte on Highway 85 and then 10 miles west on a gravel road #713. In the spring, snow run off melts in to the cave and freezes on the floor. This time of year, there’s no ice, but it’s a great place to climb inside to cool off. 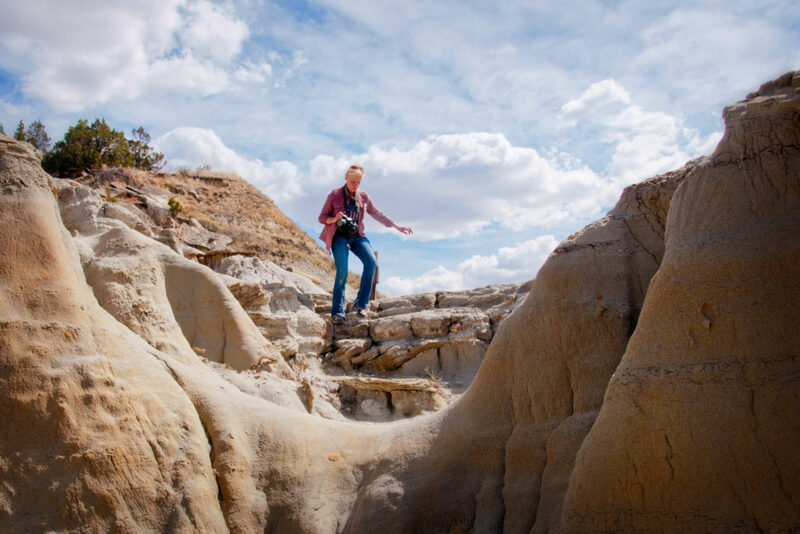 Hike around to the north of the Ice Caves to get a spectacular view of the North Dakota Badlands. The caves are directly below where I’m sitting on the edge. Hike the Maah Daah Hey to the Ice Caves. It’s a short jaunt, less than a mile from the Ice Caves Parking lot. From the Magpie Campround it’s about 3 miles, a full afternoon hike. 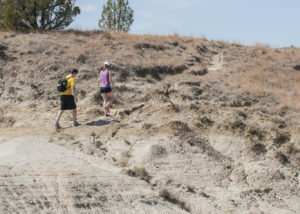 A short hike in to the Long X Trail south of Watford City will open the valley to your family’s challenge. You can stay on the trail at the bottom of the valley, or pick a point and climb to the top. 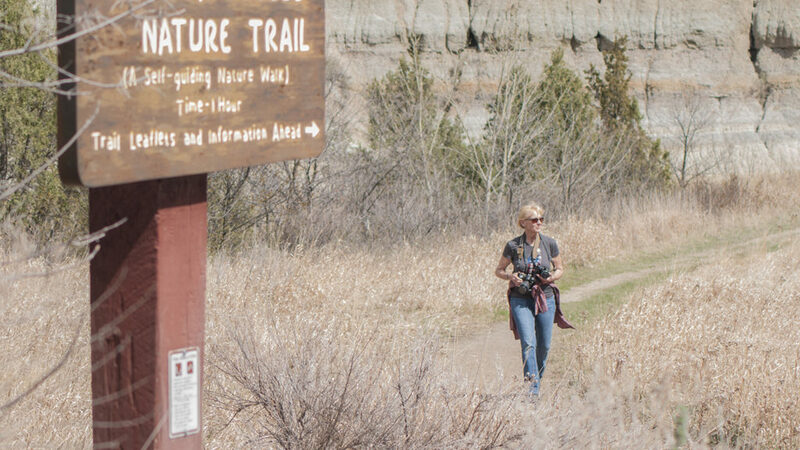 Some of the best trails for a family are the Long X Trail south of Watford City on the southern edge of the Little Missouri River. Near Grassy Butte are the Beicegel Trail and the Bennett Creek Trail. Signs on Highway 85 direct you to both trails. They are easy trails, both give you a flat starting out point and provide hill-top challenges that reward you with a spectacular view. Tall wooden markers along the trail are easy to follow. The best views are from up on high. Climbing seems is a favorite passion of children, so pick a high point that matches their skills. Even the shortest of the tall bluffs and buttes gives kids a chance to build their muscles and their confidence. A rest break is called for on the climb up a bluff off the trail. An autumn shot of North Dakota’s only lift bridge was retired from service before it ever lifted for a steamboat. This free exploration will entertain the entire family. It’s on highway 200 at the North Dakota-Montana state line. To the west of the Fairview lift bridge, or on the right side of this above photo is the parking log and entrance to the fenced-off walkway across the bridge. The safety fence gives families a safe place to walk the Fairview Lift Bridge. Children love the view from high above the water. Once you start the walk across the bridge, you’ll get a great view of the well-maintained park below where you can enjoy a picnic in the shade of the trees. Below the Fairview Lift Bridge is a park where you can fish. The final reward of the Fairview Lift Bridge is the Cartwright Tunnel. Built by hand, trains passed trough this tunnel until about 1986. Until the mid-1980’s trains passed through the tunnel across the bridge. It’s a quarter-mile long pass through the hill and provides children with a memorable experience — but take a flashlight. It gets dark in there until you get close to the opposite end. The Cartwright Tunnel has a slight bend in it. Flashlights illuminate the way. Exploring the tunnel thrills youngsters, but oldsters will be impressed with the knowledge the tunnel was built by hand by local ranchers and farmers using picks, shovels, ox or donkey carts. It’s guaranteed that you will at some point utter one word: “wowl!” It’s more impressive than you would think of a bridge and tunnel. The nearby Snowden Lift bridge is still in use. It’s downstream about 12 miles. You can see more about it here. Downstream (north) of the Fairview Lift Bridge is the Snowden Lift bridge. Though it no longer lifts, trains still cross the river on the Snowden bridge. 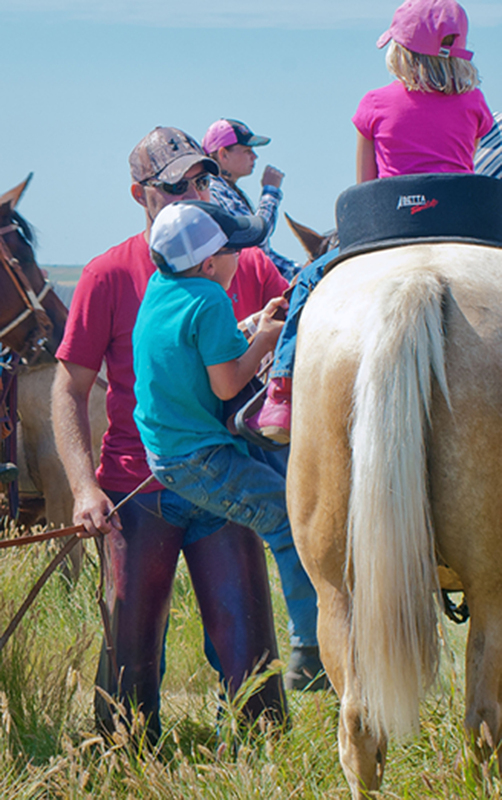 Admittedly, these free family features are on the sparsely settled region of North Dakota. 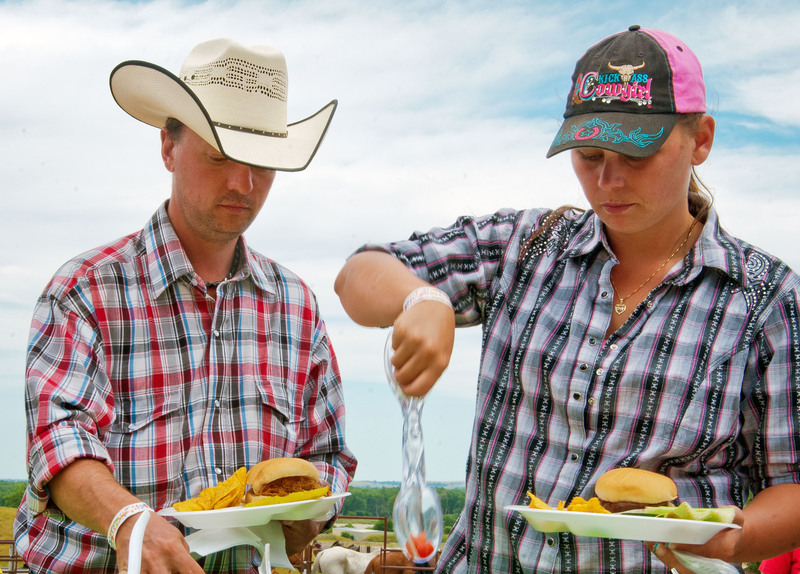 So, if you’re planning a visit, pack a picnic, or plan to stop in Sidney, Mt, Williston, ND, Medora, ND, or Dickinson, ND for a bite to eat and a break from your day of discovery. It’s all free, if you take a lunch, pack your bicycles if you want, and explore legendary North Dakota. Custer’s home hosts riders again — a reminder of 1875. Shades of history were repeated for children at St. Jude’s hospital. A century ago, riders here were in a protective mode. This time, they’re in a supportive role. It was more than 130 years ago when blue-coated riders rode the hills along the west side of the Missouri River at Fort Abraham Lincoln. Soldiers were posted there to protect railroad workers building the Northern Pacific Railroad, but their mission changed in the ill-begotten battle at Little Big Horn. I got a copy of the map where they’d ride and I intercepted them at various points such as at the blockhouses on a hill overlooking the valley. A gorgeous day for weather, not too hot, not at all chilly, a good day for soaking up sun and riding without stressing the horses. Past the blockhouses, the ride went past the original cemetery at the fort — an eerie reminder of life a century ago when people were considered “old” at 45. 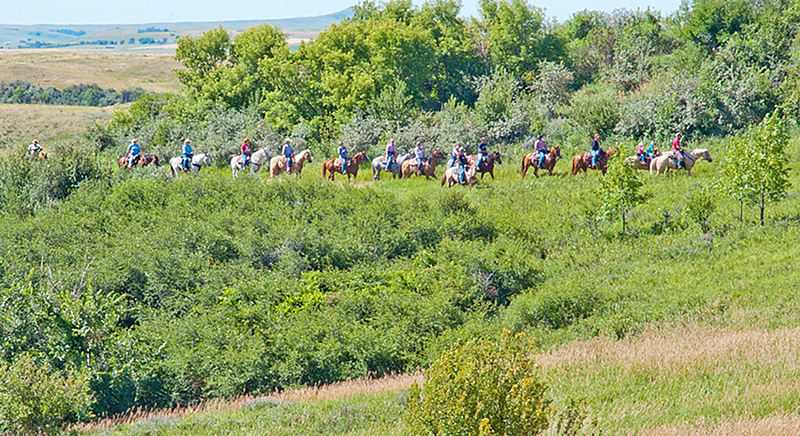 The ride started in the valley and went up the hill across the prairie and through the trees. 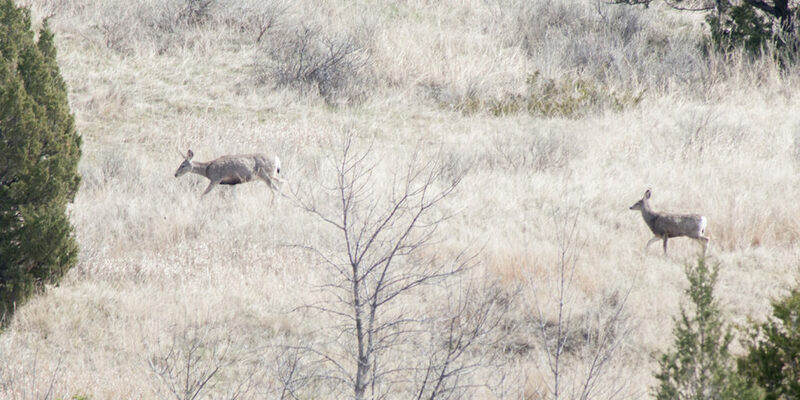 It was an easy pace — thankfully so that I could catch them at various points. 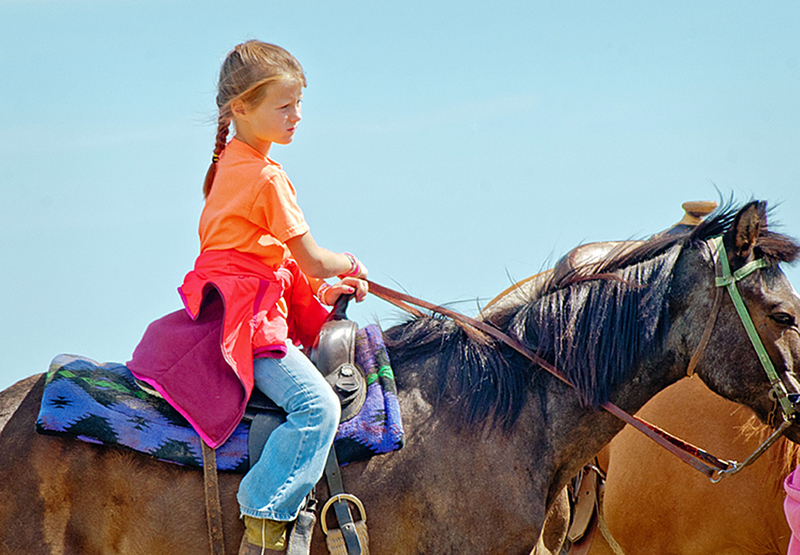 A family-centered kind of ride where children were more than welcomed — they were encouraged to get on board the powerful horses who gently submitted to the young hands. Then, it went back down to the river, and along the trees, out of the sun and in to the cooling shade. Once back at the start, later that afternoon, a pot luck feed gave riders a feast that matched the greatness of the ride they just completed. Grilled burgers, hot dogs and all the other kind of summer picnic food we love. Here is an example of a changed mind. 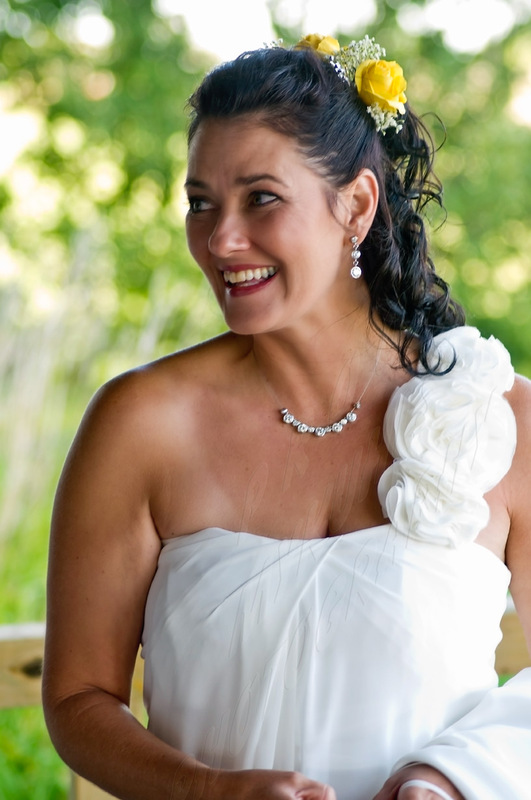 There was a time when I was strictly an industrial photographer and disdained the idea of shooting weddings. I changed my mind. Though the wedding shoot itself is a little more hectic and dramatic than shooting construction processes, the post production work, the final product is a touch of artistry that I never could touch by shooting only corporate photos. This Labor Day weekend, I got to shoot Brandy and Jared’s wedding. I’ve known them for a few years so I was personally invested in their wedding, the start of their marriage. It was with warm emotions that I spent the extra effort to give them more than just a cd of photos, but also some special touches — free, as a wedding gift. It opened my eyes to a new kind of photography that I was formerly unfamiliar with, and you know what, I like it. At least with a fun couple like the Eckroths. It’s what made special effects such as the jail shot even more fitting for them, and fun for me. It could be a scene from any suburb in America. 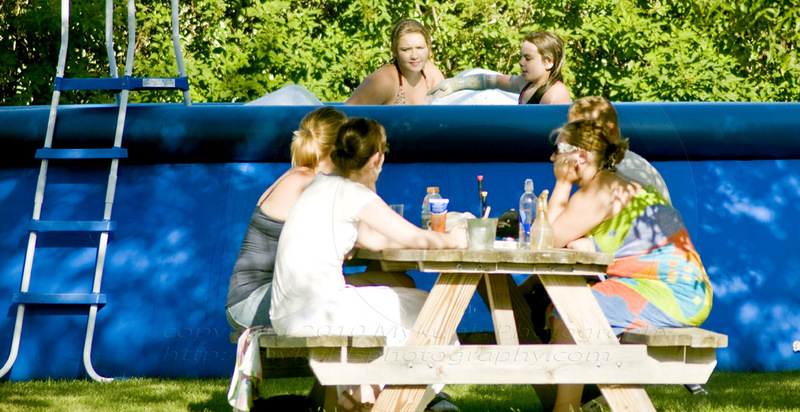 Moms gathered in the semi-shade while the kids play in the nearby pool. It’s not any suburb, it’s Wilton. A small town of 800 people along Highway 83, north of Bismarck. Life in small rural towns in the Northern Plains is pretty much like life anywhere in America — most of the time. Winters are legendary. They are rugged, but summers are intense with long hours of daylight for neighbors to gather and do what Americans do in the summer, relax and rejuvenate. Well, most North Dakotans do, anyway, the ones in town. Their rural cousins are too busy this time of year to spend much pool time, but life in even a small town like Wilton is good. 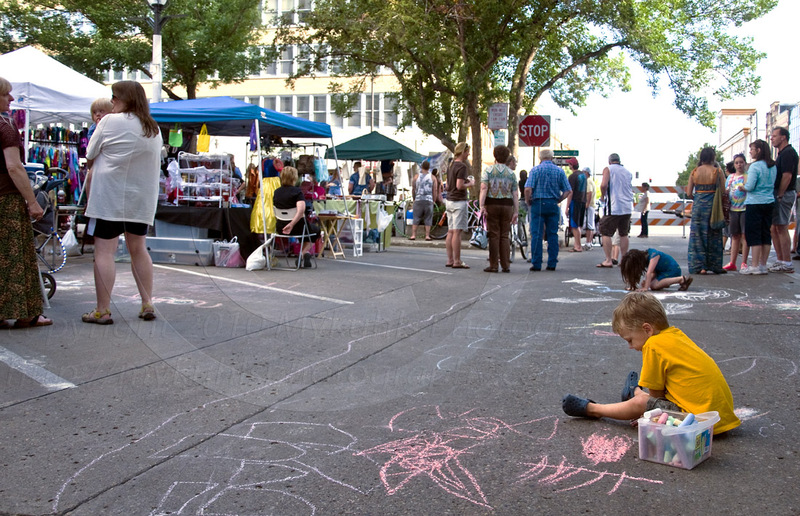 Thursdays in Downtown Bismarck is an eclectic mix of families and artistry. 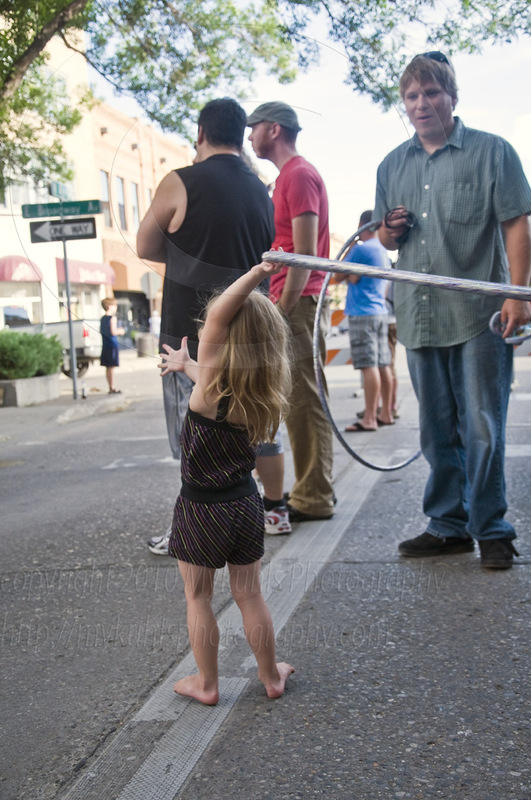 Kids are encouraged to express their creativity whether it is with chalk on a normally busy street now closed, or with a hula hoop overhead, or with a band that is more often found in an adult-only venue. 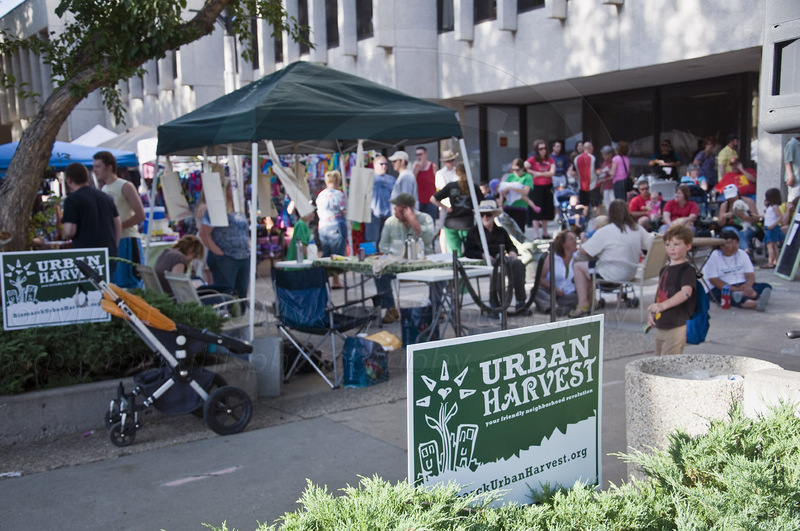 Urban harvest is a harvest of talent and expression. Each Thursday in the summer, vendors set up their booths of clothing and products that you will not find in the local Walmart or shopping mall. A variety of food is available for lunch or later for supper. 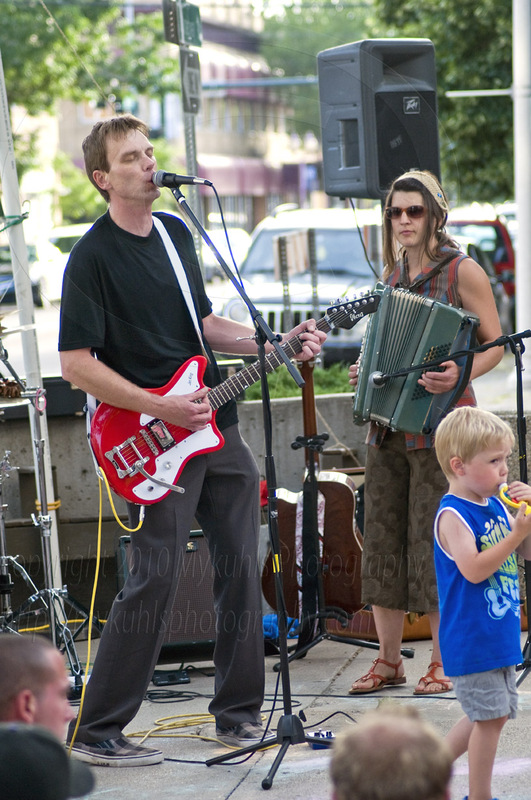 Bands play to an appreciative crowd of youngsters, business people on break, shoppers and the band’s own faithful bunch of groupies. It’s Bismarck’s attempt at offering a cultural mix that is normally reserved for larger cities or those cities further east in North Dakota such as Grand Forks and Fargo. Bismarck’s hard-working homogenous German-Russian-Norwegian stock doesn’t have much time or interest in such summer time frivolity. No, summer is for work in this part of the state. Still, balance must be an essential part of a human’s health, as well as the health of a community’s humanity. Work is good, but so is enjoying artistic expressions you might not otherwise see if it weren’t for the efforts of organizers such as those behind Urban harvest. Can you imagine the hours of hand work that go in to these costumes. The tiny beads that are threaded together to form a pattern, and then to outfit the whole family, including the growing children must take years of work. 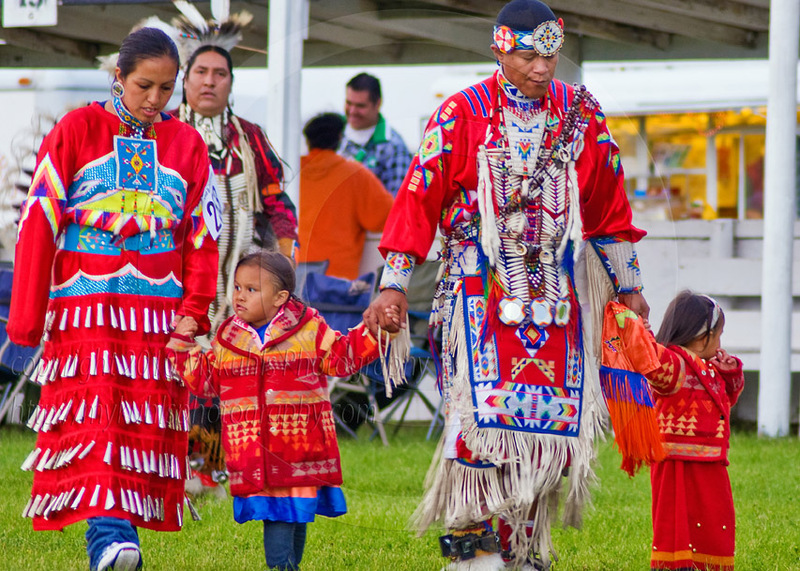 The families such as this one who make the powwow circuit invest a lot of themselves in their family tradition. 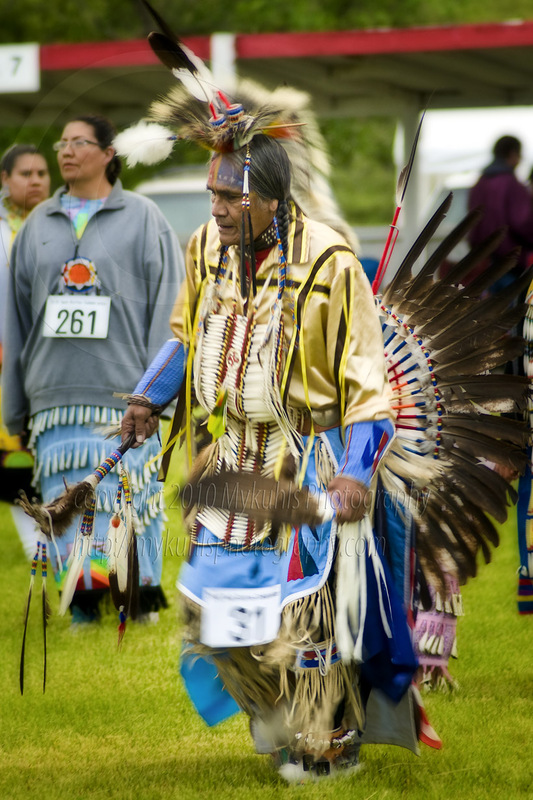 The Twin Buttes Powwow is a cultural, social and spiritual event, not one for amusement nor as a tourist attraction. It’s a generational event passed down from countless generations. 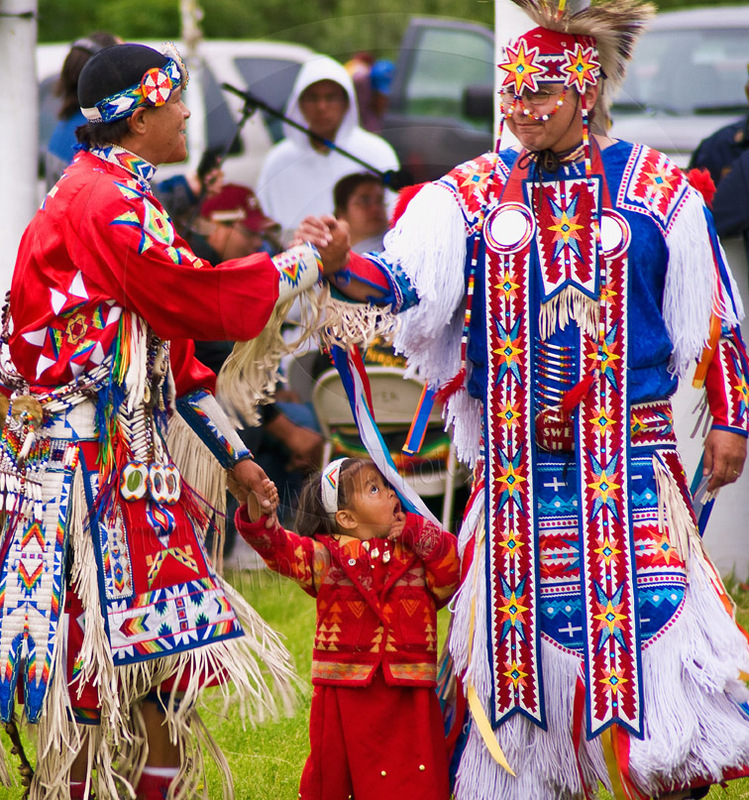 Thanks to the federal government that took the land where the powwow once was held near the Missouri River, the powwow is now nestled in the buttes and bluffs next to Lake Sakakawea. It’s not easy to find. It’s not well advertised nor marked. But the people who belong there find it year after year. 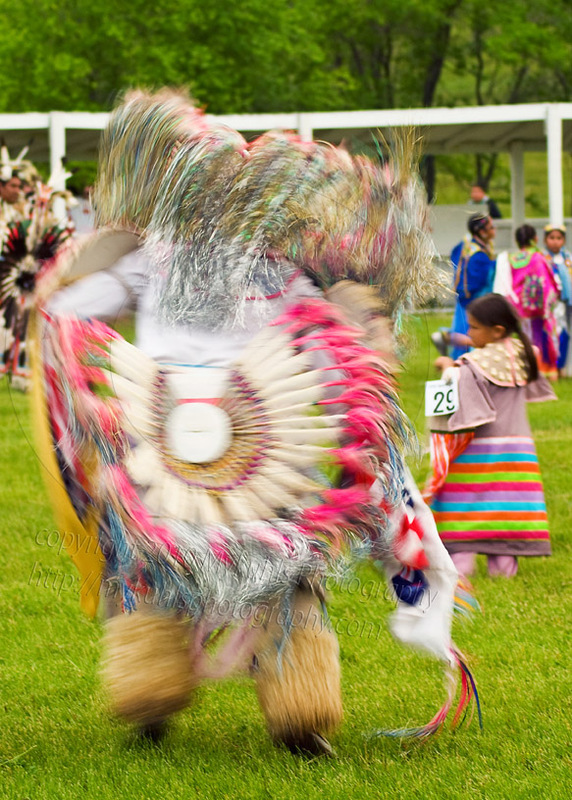 Though the federal government once cracked down on powwows and prevented them from their annual celebration, the tradition has survived. 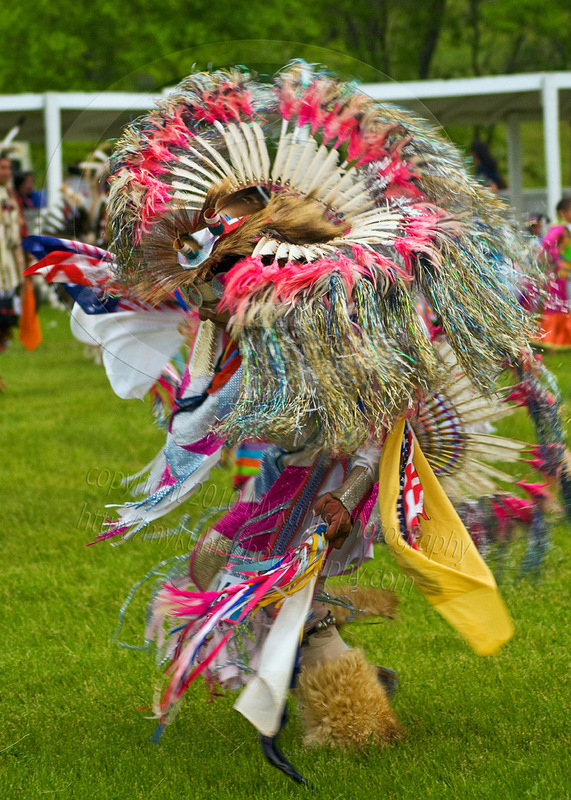 I try to attend many of the annual powwows on the Fort Berthold Indian Reservation. There are at least five of them each year, but the Twin Buttes Powwow is my favorite. It is as un-pretentious as you can get. It’s authenticity is remarkable and humbling to a visitor like me. I can think of only one or two White European traditions that have carried on for so many generations: Passover, Chanukkah, Christmas, Easter remain but perhaps altered by commercial and societal influences. Not so with this powwow. I didn’t get to stay for more than a couple of hours this year, only long enough to greet a few friends, and to see the pageantry of the Grand Entry. I was fortunate that the light was subdued and even so the photo-ops were even and colors equally visible, neither blown out nor hidden in shadows. If you care to join me next year to sample a modern celebration of ancient history, let me know. Bring your camera. Let’s go!